Lacewing eggs are oval, pale shapes, green eggs. These can be "planted on foliage on foliage in your garden. The larva are grey- green are are known for the huge appetites they possess. These guys can consume mealy bugs, red spider mites ( yes we know you hate them) thrips, some small worms and many other destructive garden bugs , insect eggs and larvae. The lace wing larvae feed for about 3 weeks and then they pupate by spinning a white colored cocoon. Give them approximately 7 days and out they come as new adults ready to lay new eggs . 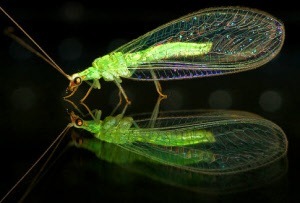 These new lacewings are light green inn color with see through wings and grow to approx 3/4 inch in length. The beautiful lacewings are shipped to you in the egg stage in container of rice hulls which makes distribution of the eggs in your garden a breeze. Release rate : For garden and greenhouses use 1000 lacewing eggs per 500 sq ft. For larger fields and orchards we suggest 5000 lacewing eggs per acre.